I can’t overemphasize how dire the Chinese food situation is where we live. There are two places: one charges a stupid amount of money per dish and the other is just depressing. I sometimes dream of opening up a tiny restaurant with just a walk-up window that only sells dumplings and noodles. To go. Only to go. Maybe I’ll even call it Noodles + Dumplings. Oh. I like that. 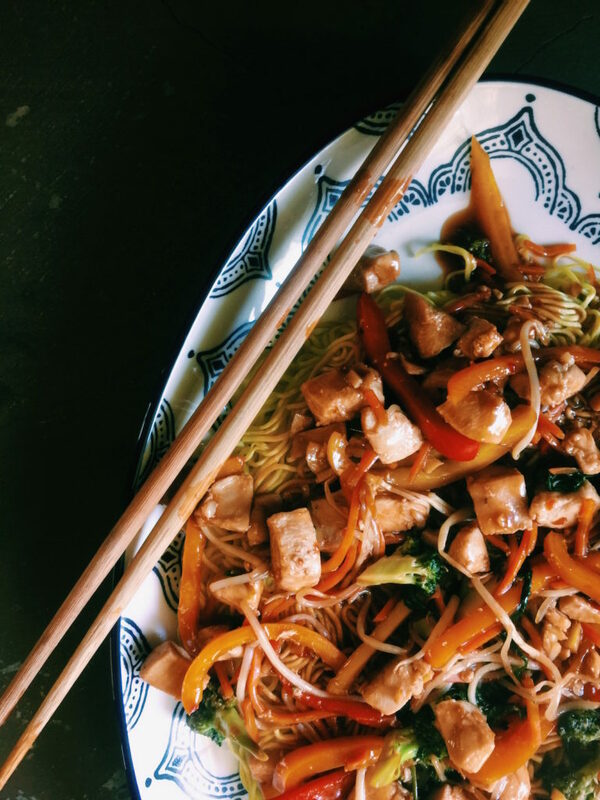 Until that time, I have to make Chinese food at home—like this chow mein. Even if I had a great Chinese restaurant nearby, I would still want to make this. I can make it healthier than any restaurant ever will. It’s tasty, easy, quick and kinda healthy. Perfect. I have a bit of a noodle fetish. I can’t get enough of them. When I learned the technique for making chow mein noodles taste just like they do when you get good takeout, I about wet my pants I was so excited. It’s all in the quick boil, cold water rinse, drain and then a nice fry to brown and crisp them up. Once you add the sauce to the noodles, the taste + texture is sheer heaven. Everyone should have at least one good, Chinese noodle dish in their repertoire. This chow mein should be yours. Make Ahead: You could cut up your veggies and boil your noodles the night before. 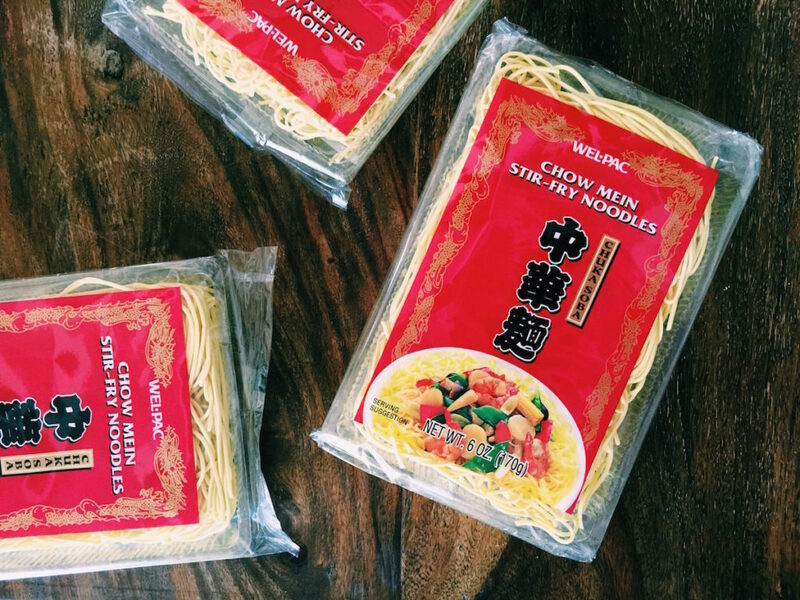 This makes loads of noodles and will probably yield tons of leftovers. I hope this makes you as happy as it makes us. I need noodle leftovers in my fridge at all times. Serve With: Thinly sliced cucumbers tossed in a splash of rice vinegar, a dash of sesame oil and if you like a little heat, throw in some chili garlic sauce. Love. So good. Variations: Pick any veggies that float your boat. Mushrooms would be great…any type of leafy green, such as spinach. Feel free to grab rotisserie chicken instead of cooking the chicken. Just have it shredded and ready to throw in at the same time as put the bok choy in the wok. I used dry chow mein noodles…if you can’t find these, you could sub in another Chinese egg noodle. I just recommend, if possible, to use the dry chow mein noodles for the best results. Make it Sophisticated: Beer. That’s all. Nothing more. Nothing less. This is a on-the-couch-watching-in-demand kinda meal. Before You Start: Have everything prepped, chopped and ready to go. I highly recommend a large, nonstick wok. If you don’t have nonstick, just know that you will need lots more oil to keep the noodles from sticking. Also, if you don’t have a wok, a large skillet will do just fine. Let’s eat chow mein, sweeties. Put on soft clothes, grab a beer and light a candle. Pause a minute to relax. Take a deep breath and be happy that you’re home and about to eat a super comforting, soothing meal. Place a large stockpot full of water on the stovetop over high heat and bring to a boil. While that’s heating up, cut up all of your veggies (garlic, ginger, bok choy, broccolini, peppers, green onions) and chicken into pretty equal-sized bits…this will ensure even cooking (and no over- or undercooking). What about putting some music on right now? Once the water is boiling, add the noodles and cook for 3 minutes. Drain, rinse with cold water and set aside to dry a bit. You definitely want to make sure they still have a bite left in them (al dente) as you’re going to cook them one more time and you don’t want them to get too cooked. In a small bowl whisk together the soy sauce, chicken stock, oyster sauce, water, chili garlic sauce, cornstarch and sesame oil. Set aside. Heat the 1 tablespoon of oil in a large wok or skillet over medium-high heat. Add half of the noodles. Using the back of a spatula, press down to make a noodle cake (so to speak). Cook for about 6-7 minutes until the underside is starting to brown. Flip over the noodles and cook the backside for an additional 6-7 minutes. Set on a large platter. Heat up another 1 tablespoon of oil in the wok and add the remainder of your noodles. Cook in the same manner as above and put on the same platter or grab another. Heat the last 1 tablespoon of oil in the wok. Add the chicken, garlic and ginger. Sauté for about 2 minutes or until the chicken looks almost done. Add the broccoli, carrots, bok choy, peppers and sprouts and sauté for 1 minute or until slightly soften and wilted. Pour in the soy sauce mixture and bring to a boil. Once the sauce has thickened and looks swamp-like, it’s done. Drizzle evenly over the chow mein noodles. Grab your chopsticks and it’s time to roll. Was that quick or what? Hi Cheyanne!! Thank you!! Let me know how you like it. P.S. I love Dumplings + Noodles too!!! Okay, made the chicken chow mein/veggies. Kinda. As usual, didn’t have the correct ingredients. Substituted the chicken for top sirloin. Shamelessly used a bag of broccoli slaw, added asparagus, carrots and green onions. Only used one bag of noodles. Used Asian oil instead of sesame oil (thank you El Rancho). Marinated the meat in the sauce before stir frying. Then threw in the remaining sauce at the end. AMAZING! So delicious. A keeper recipe, as usual Displaced Housewife. You are the queen! I adore good Chinese food… however, you are right. GOOD Chinese food is hard to find. There are a few around my area, but I still prefer to make it myself, because you know what’s in it and you can adjust it to your taste. 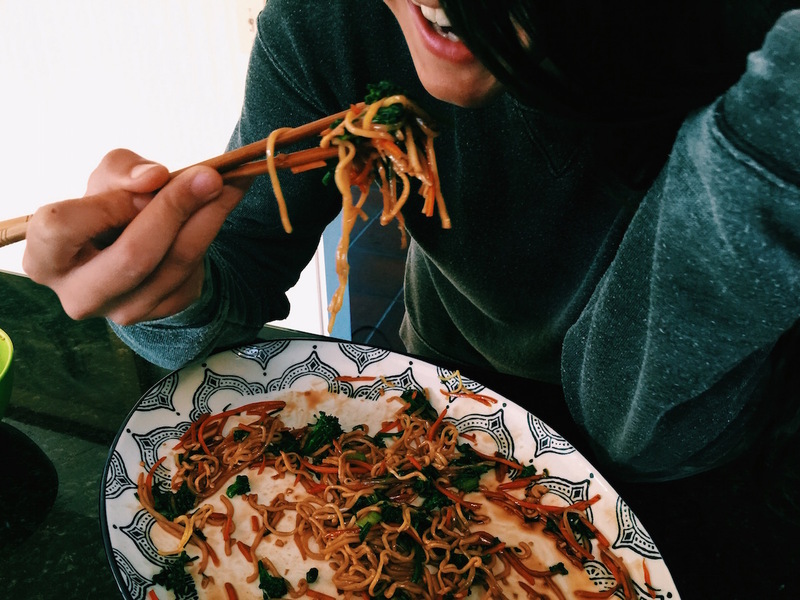 Your chow mein looks seriously yummy and I’ll bet it tastes even better! Definitely going to be giving your version a try! Thanks for sharing ♡ P.S. your to-go restaurant name is super cute. I’d totally stop by your window and order up some noodles or dumplings! Cheers!